Cricket Supporters’ Association member and volunteer, Annie Chave, shares her report and reaction following the recent ‘Inspiring Generations’ conference hosted by the Devon Cricket Board and a chat with the ECB’s Tom Harrison. Billed as ‘Inspiring Generations’, a conference to showcase the ECB’s Five-Year Strategy for Cricket (2020-2024) was hosted by the Devon Cricket Board at Sandy Park Rugby Ground in Exeter on 28 March 2019. The aim was to explain how Devon Cricket will integrate its planning with the ECB’s new strategy. Looking round the room, I could see that there was a good mix of generations, ranging from 16 to 70, around 20% of whom were women. Since Devon is 94.9% white British, the lack of ethnic diversity was no great surprise. 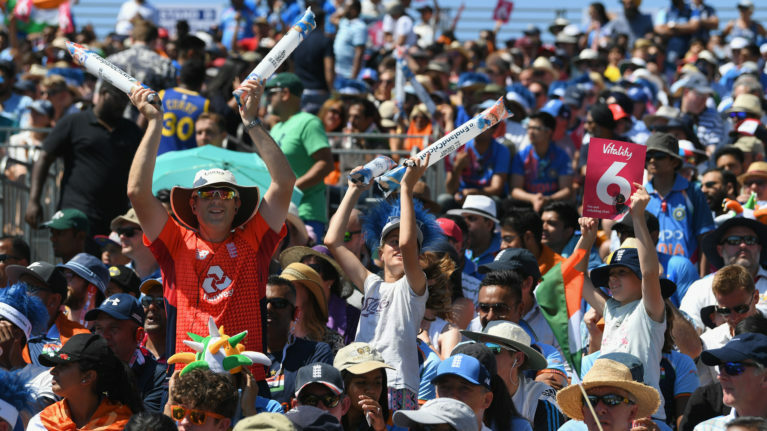 Given the demographic, it can be said that there was a good turnout of cricket-loving fans just before the start of a new season, coming together to learn of the ECB’s plans to ensure that cricket continues to thrive and to inspire generations. So why did the occasion feel so insistently corporate? It’s as if the word ‘Conference’ necessitates the overwhelming presence of men in suits handing out glossy brochures. Despite the inevitable power-point presentations, it didn’t feel cutting-edge, and there was no convincing evidence that we were finding new ways of bridging the generation-gap. The ECB’s focus was on children, but there were no children’s voices to be heard. The whole evening was billed on the premise that, although cricket is healthy in most parts of this country, it needs to adapt to a rapidly changing society. When Tom Harrison, the ECB’s Chief Executive Officer, was introduced as the keynote speaker, one of the first things he did was to quote a favourite motto of gung-ho corporations, ‘You may not like change, but you’ll like irrelevance even less’. This was the guiding principle for the ECB’s introduction of their ‘new competition’, The 100. After extensive research and hundreds of consultations, Tom Harrison was emboldened to claim that the ECBs ‘Five Year Plan to Inspire Generations’ is the only plausible way forward: one thing, he promised, that you’ll never hear him do is ‘apologise for seeking to grow cricket’. And you won’t, I don’t doubt that at all. In talking about the state of cricket in our country, Tom Harrison was not only ready to admit, but also keen to stress that currently it’s thriving. There are approximately 2.5 million players and 20.5 million followers annually. And it’s noteworthy that, currently, our Women’s team are world champions and our Men’s ODI team are number one in the world, that we still have huge attendance figures at Test Matches and that we have a strong county network. All this, he said, should be coupled with new broadcast partnerships as well as with commercial partners who share the vision of the power of cricket. He’s proud of the position we’re in, and he’s keen to capitalise on the impetus of this year’s World Cup and Ashes to retain the present spectator base and to capture yet more. The ECB’s five-year plan aims to do this by balancing the need for the sport to continue to serve its loyal fans with the goal of extending cricket’s appeal (particularly to younger audiences and to women and girls). I found some of what Tom Harrison said a hard pill to swallow. I’m one of those loyal fans, and I know I am not alone in feeling invisible. Many of my questions remain unanswered and some of my concerns derided. I was hoping that the answers would be forthcoming and these concerns addressed. But …. – To support our communities. The plan will see more investment than ever before, with the initial sum of a cool £485 million. There is no doubt that the six nominated priorities are really worthwhile, and, if the money is well spent, we should see real improvements in these areas. Tom Harrison recognises the need for money to be channelled into schools, and he hopes for an increase in participation in Primary Schools from 22% to 40-50%. He understands the need to make cricket more accessible, with inroads being made in urban centres. The ECB has been helping the London Cricket Trust to install non-turf pitches in London parks, a great initiative which targets the massive issue of accessibility in cricket. The theory is great, but the details that he shared were, inevitably perhaps, vague, and there was no mention of Secondary Schools, where, surely, there is the greatest need for investment. It is at this level that the gulf between private and state schools is most apparent, and it is over these years that children are learning and developing targeted skills. Chance to Shine has been a fantastic success, and we should build on that by targeting the older age group. It is during the ‘secondary’ years that interest waxes and wanes. The ECB is not confining itself to new initiatives. As Tom Harrison explained, £55 million will go to the first-class counties over the next five years to help fund the County Championship, the Vitality Blast and the Kia Super League. He made no mention of the Royal London One Day Cup, but, when I quizzed him afterwards, he said that was just an oversight. Perhaps, then, I risk reading too much into his not mentioning the one-day game, and maybe I place too much importance on the fact that it is being relegated to minor grounds in 2020 and stripped of overseas players. Even so, I remain sceptical about the introduction of a new format in an already over-crowded schedule, and it’s surely pertinent to ask how this can possibly be reconciled with an intention of capitalising on the impetus of the World Cup? Tom Harrison then talked about The 100. I’ve written a fair bit about this, and I don’t want to go into too much detail here. What was clear is that he is fully committed to it. He introduced it as a competition that ‘will be the most successful thing that English cricket will be involved in’. He has ‘never seen such a positive reaction’ from people involved in its trials, with the players’ feedback hailing it as ‘proper cricket’. Whilst he recognises the popularity of The Blast, attendance at which has grown by 115% since 2012, he criticises T20 for its ball-by-ball slowness. It is, he says, the slowest format of the game. The 100 will address this issue of time. And yes, he has a point. There are occasions on which a T20 over seems to last an eternity. But this, surely, is something that can be addressed within the format itself, and it’s difficult to see how a format like The 100, designed to give each ball maximum weight, is likely to speed up the game. I feel equally ambivalent about another of Tom Harrison’s positives. The 100, he argues, simplifies the game of cricket for new spectators. A counter-argument is that the game’s complexities are what make cricket great. Clearly, though, Tom Harrison and many of the powers that be, fearful of irrelevance, feel the need to provide a competition that people can more easily understand. And this competition – the final, clinching argument – will be available on Free-to-Air Television. Tom Harrison says that it is only this new competition has made this possible. Thirteen matches in The 100 will be shown on the BBC, and the impact on the population at large, and on young potential cricketers in particular, will be huge. This, of course, is another contentious issue, and one on which I needed to bite my tongue. It was the ECB which took cricket off free-to-air when they sold it to Sky in 2005. Bringing it back, if not an act of contrition, is a definite U-turn. As Vic Marks has said, ‘now we have an implicit acknowledgment that the decision, taken more than a decade ago, not to insist upon some cricket remaining on F-t-A TV was contrary to the best interests of the game’. An implicit acknowledgement is better than none, and having cricket back on the BBC can only be a good thing. Tom Harrison’s was a well-rehearsed, cleverly positive speech that aimed to leave no doubt that The 100 was the only avenue. I can see the reasoning, but I think it’s been clumsily introduced as a concept. It throws up real concerns about the future of the first-class counties. There was some irony in the holding of the Conference in Devon, as The 100 won’t be played here. I was told that I could watch it on TV, but I think that misses the real point of exclusion. Somerset C.C.C., which was well represented at this conference, will not be hosting The 100, Cardiff will be the closest ground. There was nothing in the speech, or in my conversations afterwards, that has helped convince me that the 10 counties that aren’t hosting The 100 will still have first-class status beyond the next few years. My greatest fear for Somerset – that Taunton will dwindle into a host ground and a venue for bands – is still with me. Those professional cricketers who proclaim that the white-ball game is the ‘only way forward’ do no service to many of their fellow-professionals. And if The 100 takes hold of the nation’s cricket, if it proves as ‘inspirational and successful’ as its advocates believe it will, how bleak will be the outlook for the also-rans? At the end of the evening Tom Harrison tried to reassure me that I will love The 100, but seeing as it is as far from the County Cricket that I love & it threatens to jeopardise its existence, I have reason to doubt that. Given the time and money that The ECB are investing into this ‘new competition’ I hope that it is the success they expect it to be and I hope it generates the income to maintain the other formats as it promises it will, otherwise I fear for the future of all cricket in this country.